The information below has been supplied by dairy marketers and other industry organizations. 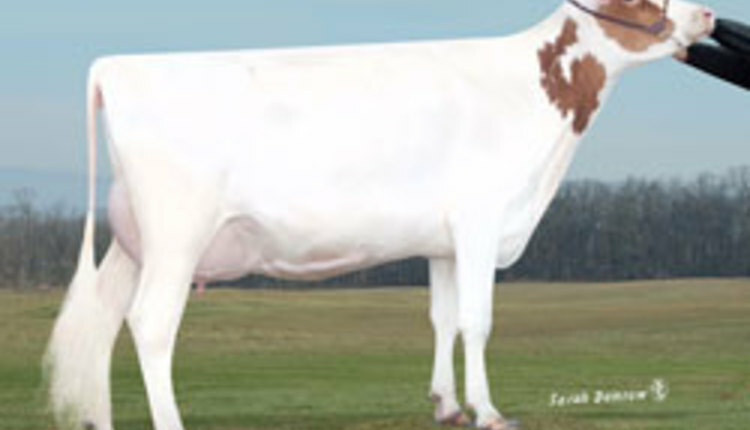 It has not been edited, verified or endorsed by Hoard's Dairyman. The milk receiving step at dairy and cheese making operations is critical to product quality. Dairy operations need measurement solutions that help them deal with two key milk receiving issues – the aeration that occurs due to agitation in milk trucks traveling from the farm to the dairy plant; and the need to identify and measure the milk components. Older measuring solutions for these milk receiving issues are slow, costly, and inaccurate. Now, new inline measurement devices are available that help with process optimization and quality improvement. Milk receiving is traditionally done by the use of large platform scales onto which the milk trucks drive. Once unloaded, the amount of milk received is established by subtracting the net weight of the empty truck from the total weight recorded at arrival. This method is quite slow and results in an average error rate of at least 2 percent. When a raw milk truck arrives at a dairy plant downloading station, the milk is always aerated due to the moving and shaking associated with its transportation. Typically, during milk transfer there is also a significant amount of air introduced in the line at the beginning, since the air is trapped in the line and at the end when the milk level is low, due to the syphon effect. Measurement by volume flow is an alternative to a weigh scale. However, most volumetric flow methods cannot distinguish air from milk. Therefore, any air in the transfer line leads to measuring errors. A more recently introduced technology for measuring incoming milk is the Coriolis mass meter. Coriolis meters are more accurate however most cannot handle high amounts of entrained air. When an air pocket passes the meter during the start of a truck unloading cycle or at the end when the fluid is being syphoned, such a typical meter would stall and no longer measure at all. De-aerators are used to remove the air in the milk. This adds costs, and adds delays while significantly complicating the milk fluid transfer process. De-aerators can be costly capital equipment, which takes up space and needs to be maintained, cleaned and sterilized frequently – adding to operating costs. Currently, it can take up to 30 minutes to unload a truck and there may only be a certain limited number of loading bays. End users typically want to unload a truck as quick as possible, ideally in 4 to 5 minutes, so the next truck can unload, but current de-aerating processes do not allow this. Dairy operators are looking for faster and more effective milk transfer for several reasons. One critical motivation is processing time. The faster milk moves from the farm to the pressurization stage, the safer it is for the product and the less risk of bacterial contamination. Every minute of additional processing adds to possible product degradation. A new preferred option is the elimination of the de-aerator altogether. This can only be achieved with the use of new straight tubes Coriolis mass meter technology that incorporates an entrained gas management (EGM) system. For example, the new OPTIMASS developed by KROHNE can handle the challenge of entrained gas during measurement without stalling the meter. It provides an overall accuracy on milk transfer to better than 0.2 percent. This new type of meter with EGM was used recently for flow measurement of raw milk at Frischli, a German dairy which manufactures individual coffee cream portions. The raw milk needed for production is supplied via two pipelines to several buffer tanks. The company used two regular mass flow meters, but found their measurements were repeatedly affected by the entrained aeration gas in the raw milk which was produced during transportation. The de-aeration tank could not fully eliminate the entrained air, and this was affecting their meters and resulted in inconsistent performance and disruption of the signal processing which then created significant measuring errors or loss of measurement altogether. Once they installed the OPTIMASS mass meters in front of the buffer tank, they were found to be immune to the negative effects of entrained gas in raw milk. Using the EGM feature, the devices continuously measured the volume, mass and density, even with entrained gas varying from 0 to 100 percent. The problems of flow measurement caused by entrained gas have now been resolved and they now have continuous monitoring of the raw milk. To optimize its operational processes, the dairy can now readily compare the incoming raw milk volume to the produced coffee cream. Any dairy which is considering a new loading bay should compare a large platform scale with this type of flow measurement device. The OPTIMASS flow meter with the new EGM gas management feature provides a better overall accuracy while facilitating a faster transfer rate. Since a de-aerator or a truck scale, which costs five to ten times more than the meter are not needed, this will also lower the project capital costs while also reducing operational costs associated with cleaning and maintenance. Milk is an emulsion with different components, including water, protein, fat, and lactose. Since dairy plant operators often pay suppliers based on the amount of fat and protein content received, they must be able to accurately measure these milk components. If the measuring method used results in even a 1 percent error, that equates to significant money per tanker truck load. One significant measurement challenge is the variation of the measured fluid. During transportation, the milk settles into stratified layers and the fat rises to the top. For each tank load, the range of difference in fat can be as much as 3 percent, with 5 percent fat at the top and 2 percent on the bottom layer. Therefore, as milk is being unloaded from the bottom, the milk properties are continuously changing, from low to higher fat content. 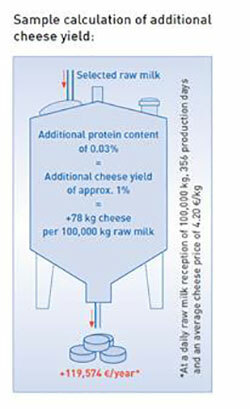 Another key parameter in the production of cheese is the milk protein content. Higher protein content increases the yield of cheese that is produced. Therefore, raw milk that is rich in protein is much better suited to high-margin cheese products than raw milk with low protein. Certain types of cheese need specific amounts of protein. Pre-batching received milk with the right percentage of protein for these particular cheeses is often done so plant operators can maximize production yield from each tanker load. Per the example in the graphic below, increasing overall protein concentration in the raw milk reception tank by only 0.03% can conceivably result in about 1% more cheese produced. In addition, having a consistent ratio of protein to fat content in the tank makes it easier to control the production process. Dairies that also produce other products, such as milk or milk powder, cream, and others need to optimize the specific amounts of fat or protein in each product. Knowing how much of each constituent is in the received milk helps to manage the processes and to maximize yields. An accurate accounting of the amount of fat and protein received versus the amount of produced product is widely used to determine a production plant’s overall efficiency and to tune production line processes. Laboratory measurement is traditionally used to determine the amount of protein and fat in a tanker truck load. At reception, using a large ladle, analysts simply take a sample from the top, middle, and bottom of the truck or tank. They then put the three samples in individual vials and carry them to an on-site lab to analyze. While the lab analyzer equipment itself is quite accurate (in the .03% range) the overall analysis process is affected by human error and a general lack of sample handling repeatability. Also, the presence of globules of fat in the samples leads to errors. Just a few fat globules (which are very large in raw milk) drawn into the sampling vial, can dramatically change the sample concentration and they may no longer be characteristic of milk quality. Mixing multiple samples into one composite sample is another traditional alternative for determining the overall amount of fat and protein received. However, this process still results in inaccuracy, depending on how representative this composite sample is compared to the full truck load. While providing more data points than the 3-vial method, this blending method still results in a nominal 1 percent inaccuracy rate. Using at-line analysis instrument which takes samples in-situ and analyzes them automatically is another alternative. These are lab analysis instruments which have been adapted with automatic sample handling systems. However, while measurement speed is better than the manual alternative, it is still relatively slow – about one measurement every 1-3 minutes. Furthermore, these devices are still drawing a small milk sample and users must assume that these are representative of the whole milk. These analyzers are at-line and cannot measure directly inline because of their traditionally used transmission based measurement method. They feature a very small measuring gap (only a few micrometers) and they are prone to issues caused by cold fluids or samples with high concentrations. The fat globules in cold milk are very large and tend to plug the measuring gap, so in many cases the milk needs to be preconditioned, either by heating it up or even homogenizing it, before sending it onto the analyzer itself. This demands complex and maintenance intensive equipment and can further slow the analysis process. Most recently available are inline measurements that can continuously measure fat and protein in a constant flow of milk. These inline devices can measure continuously the whole fluid within the process pipe without any sampling. Such a device, the OPTIQUAD M spectroscopic analyzer from KROHNE, measures protein, fat, and lactose in cheese making processes directly in-line with an accuracy comparable to a lab analyzer. The device combines 4 different measuring principles with up to 12 light sources over a wide spectral range. It can continually measure cold raw milk without any sample treatment directly in-line with a 3 second response rate. This optical process technology can be used to improve dairy product quality while increasing productivity through yield increases and resource optimization. Based on real time measurements better batch reproducibility could be achieved through automatic control. Product safety and regulatory compliance can also benefit while also cutting down laboratory analysis costs. For example, the Belgian dairy Fabrelac (now part of Friesl and Campina Ingredients) wanted to use automation to increase cheese yield by making full use of process information to maximize mozzarella output. As one of Europe’s leading suppliers of mozzarella, Fabrelac also wanted to achieve constant cheese quality, make the most of by-products, and save money by avoiding sampling activities. They previously used manual sampling with laboratory analysis to determine the milk protein and fat content of received milk. They wanted to eliminate the delay before the values could be used for process control. Now readings from OPTIQUAD devices installed in the 2 raw milk lines are used, along with the electromagnetic flowmeter in the same line, to report the average fat and protein content of the raw milk streams. Measured values from another device installed behind the buffer tanks are used to standardize the protein and fat content during cheese milk preparation. Fabrelac can now assess the quality of raw and cheese milk, allowing them to dynamically re-adjust operating parameters at every production stage. Another European producer of dairy products offloads tanker trucks delivering raw milk using an open drain system that feeds the milk into a buffer tank. To achieve a cheese yield increase, the company decided to improve the milk reception process by supplying the delivered raw milk with high protein content into a separate storage tank. They needed a measurement solution that could continuously provide precise readings of the protein content in delivered raw milk so they could run an a PLC-based automated control system and control the valves of the pipeline feeding the two storage tanks depending on the protein content measured. They also wanted to measure the fat and lactose content. After installing the OPTIQUAD spectroscopic analysis system, they were able to provide exact readings of protein, fat, and lactose content every 10 seconds. The new system allows them to separately collect raw milk with above average protein quantities. The new raw milk storage process also allows them to raise the protein content in relation to the fat content even before the separation, which can lead to a significant cheese yield increase. They can also calculate the fat and lactose ratio in the raw milk delivered. Many dairy and cheese making operations are moving towards complete automation for process optimization and quality improvement. New measurement technology is ideal for increasing protein content in cheese-making milk or vat milk, standardizing fat content, or setting a constant ratio of fat to protein in cheese production.